Originally when I titled this piece, it was going to say "Dillon Campbell is a scary force in the OUA." 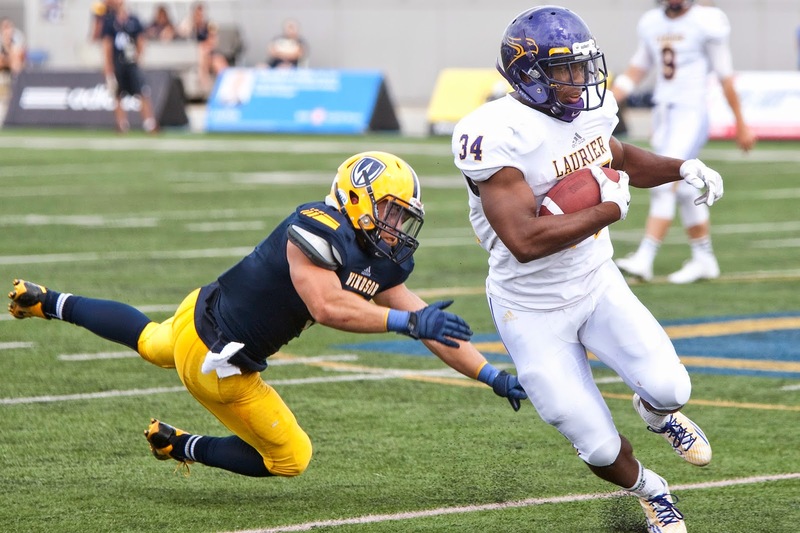 But after watching DC post over 200 rushing yards quietly Saturday afternoon for the Wilfrid Laurier Golden Hawks to bring his season total after three games to over 650, I started thinking "who in the CIS would be even close to him?" Last year's Hec Crighton Trophy winner was Bishop's quarterback Jordan Heather after he set a new CIS record with 3,132 passing yards in a season. He beat Will Finch, Western's poster boy, who also set the CIS record that year, previously held by Michael Faulds, former Mustang quarterback and now bench boss of the Hawks. Heather was good -- he deserved that trophy. No only did he shatter Finch's record posted just a week previous, but Heather played for a team that had to deal with the Laval Rouge et Or on a regular basis. But he was a fifth-year golden boy and his time to shine is gone. So, who else could possibly be boasting a better track record three weeks into the CIS season? It's not Will Finch, who has been mediocre thus far through two games for the 'Stangs: He's 42-for-57 with an impressive and country-high completion percentage of 73.7 per cent, with 572 yards. The only reason I say "mediocre" is because five of his OUA counterparts boast the top-5 yardage in the OUA, followed by Laval and then James Fracas of the Hawks. Finch was the main contender in the offseason to be the OUA nominee for the Hec. Derek Wendel of Ottawa, a quarterback who came out of nowhere this season, currently boasts 70-for-110 for 844 yards -- a CIS high. Queen's Billy McPhee, Toronto's Simon Nassar, Windsor's Austin Kennedy (who also has 362 yards per game after two games) and McMaster's Marshall Ferguson round out the top five. But do any of them really have a huge, impressive number ratio like Finch or Heather had last year? Now, we move to D. Campbell, who after three games is off on his own in the world of rushing. Although most teams in the CIS haven't played three games, Campbell's numbers are still obscene. According to the CIS website, after three games, DC has 68 rushing attempts for 674 yards, averaging 224.7 yards per game and 9.9 yards a carry. He has scored five touchdowns and his longest rush was 98 yards against Toronto. In a media scrum Saturday, we asked if Dillon got his knitting done in the second half of the game, as his day ended at 204 yards through just over two quarters. "It's crazy to think about," Campbell smiled as five recorders were held in front of him. "The guys joked about it at half, 'DC, only 169 [yards] so far. What's going on?' When realistically, that's a great game, right?" "Last season, my most in one game was 180 against Waterloo. And now, I'm averaging 200 a game through three games." After three games, Campbell is already only 193 yards away from his OUA-leading 867 yards a year ago. THREE GAMES. The next closest in the CIS is Ashton Dickson from St. FX, who has 369 yards after two games -- averaging about 184.5 yards a game. It's hard to argue with the numbers, but it's also very early in the season. Laurier heads into a bye week this week while the rest of the CIS beats each other up. Laurier has five games when they return, three of which are against harder opponents than Waterloo or Toronto (Western, McMaster and Guelph to finish off the season respectively). But if Campbell can continue to boast numbers where he's en route to beating his record from a year ago -- he's en route for 1,800 yards if he continues where he is now -- that made him a sensation after once being buried in a depth chart, I will be the first to start the #CampbellforHec campaign. * Disclaimer: Shelby has covered the Wilfrid Laurier Golden Hawks for over three years. 2nd disclaimer: Laurier's three games were against Toronto, Windsor and Waterloo. They actually didn't win against Windsor, but DC still recorded 177 yards. I agree that the opponents have not been the strongest -- which is what I explain in the second-last paragraphic (they have a heavy ending to their season). But the numbers right now regardless are impressive despite the opponents.